Sunday, April 21, 2019 • R.I.P. Edition • Those who arrive survive. Maybe. 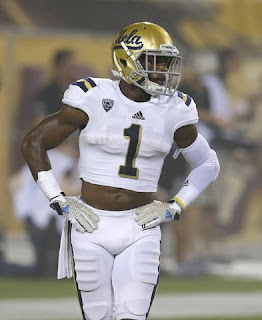 According to The UCLA student paper The Daily Bruin, Adams was arrested by UCLA police for allegedly stealing the cell phone of an Uber Driver. "Adams, a redshirt junior on the UCLA football team, was arrested about 3:30 a.m. near the Facilities Management building in central campus about a block away from the reported robbery, according to police logs. His bail was set at $100,000. Adams was arrested about 12 minutes after the driver called police and reported the robbery. The driver also reported apparent minor injuries, police said." Police have not yet formally charged Adams, according to reports. UCLA is set to open its season at home against Virginia on Sept. 5.